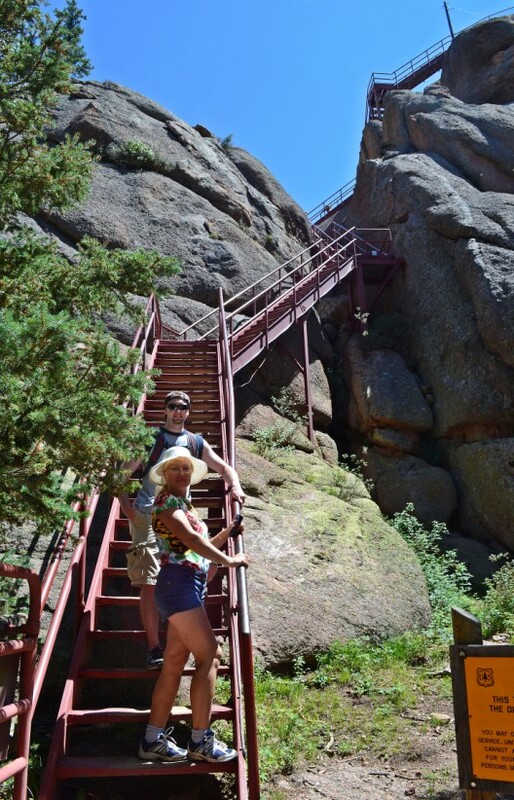 As avid hikers, one of the main items on the agenda for my wife and I during our recent time in Colorado was to get into the Rockies and hit the trail. 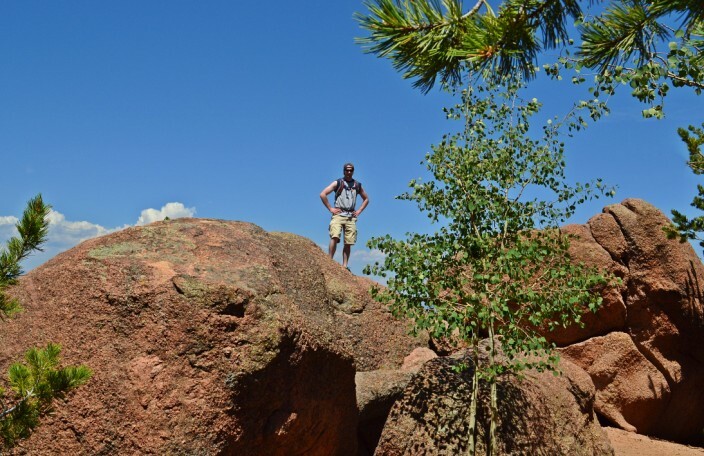 We didn’t have the time, unfortunately, for a major backpacking trip but we did want to experience some high country views as best we could on a day hike while not venturing too far afield from our base near Denver. 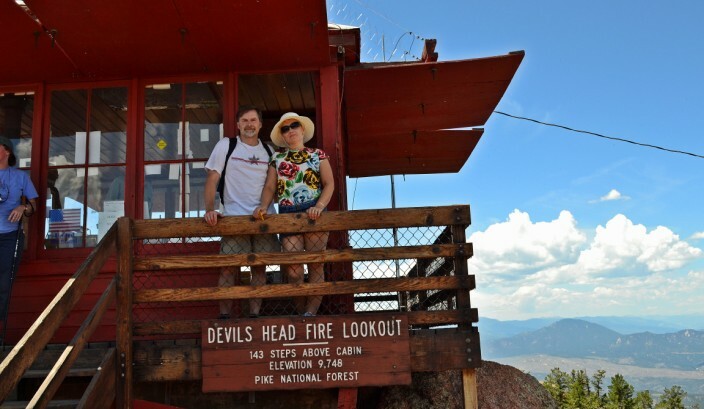 As recommended by Jonathan, our host, trail companion, chauffeur and all around good guy, we opted for the Devil’s Head Trail leading to Devil’s Head Fire Lookout. 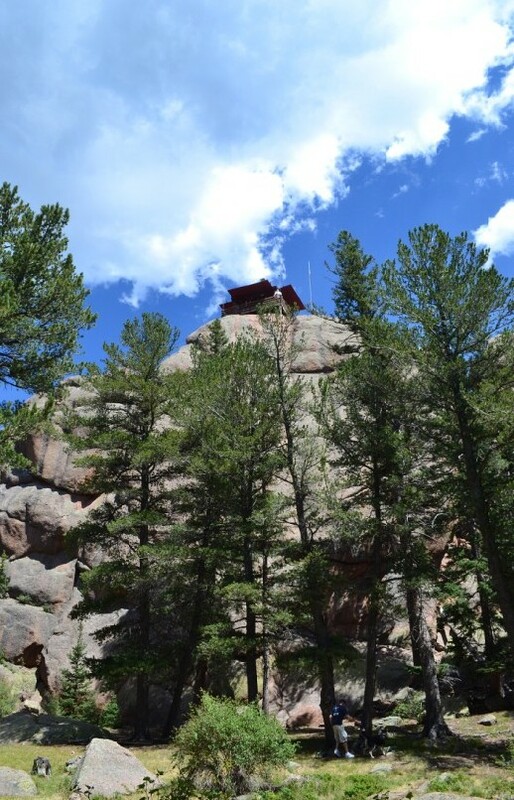 This is the only fire lookout still functioning and fully staffed by U.S. Park Service in the state of Colorado. The station was established in 1912 and the lookout tower has been in continuous operation since 1919. The current structure was built in 1951 to replace the original. 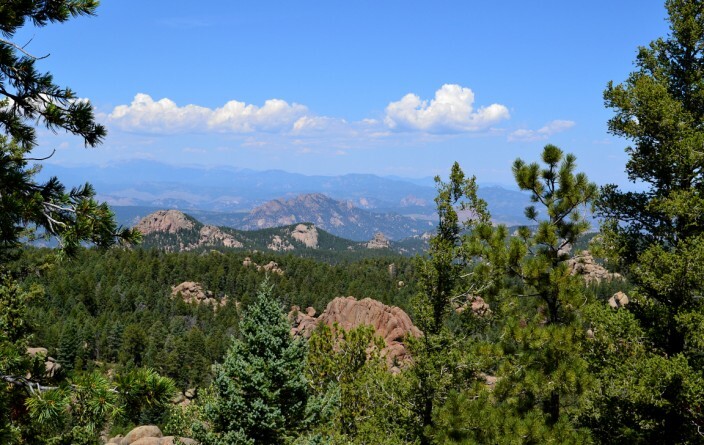 It’s an easy drive to get there, about an hour to an hour fifteen minutes from the Denver metro area depending on your starting point. 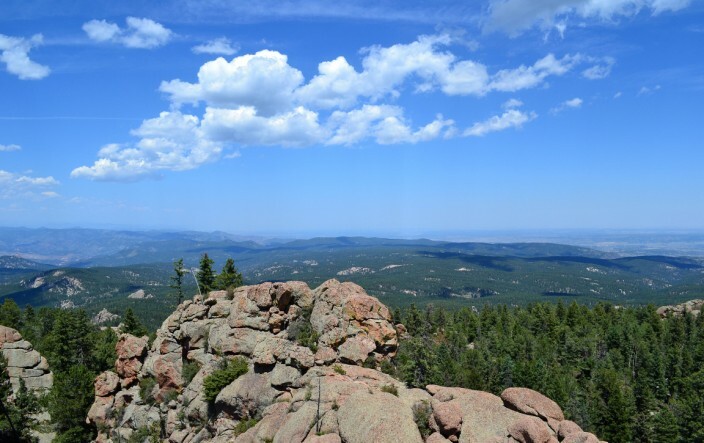 Take highway 85 south to Sedalia, turning east on highway 67 which winds upward into the mountains and is a beautiful drive in it’s own right. Turn south onto Rampart Range Road and drive ten miles to the trailhead parking area. Be aware the Rampart Range Road is washboard hard gravel and can get pretty rough and very dusty, but with a little care any two-wheel drive vehicle should have no problems. 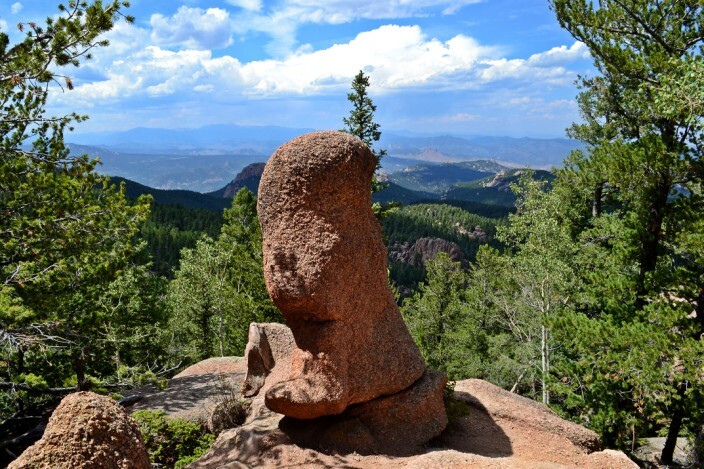 To most Coloradoans, Devil’s Head is a basic, must-do day hike if you consider yourself any kind of hiker at all. The trail is moderate, about 950 feet in elevation gain over three miles total, in and out, eminently doable for folks in decent shape. 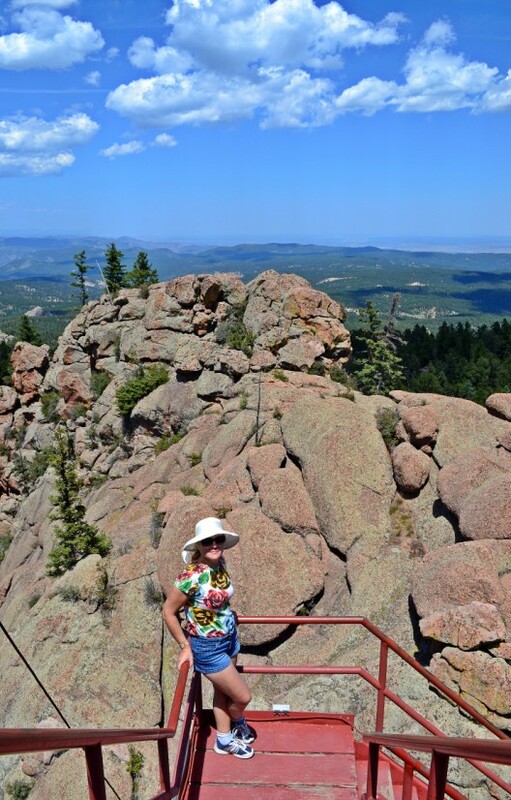 But be warned, it is all uphill going in and finishes with 143 stairs from the ranger cabin to the lookout tower itself. The stairs feel a little bit rickety and you want to watch your step if they’re wet. You also might have to wait at the bottom if there are crowds as only ten people at a time are allowed at the top. Speaking of crowds, go early if you want to avoid them. 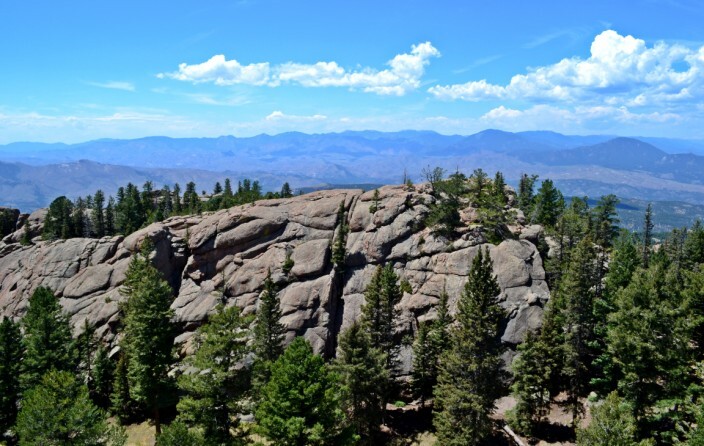 This is a very popular hike due to it’s ease of access and small degree of difficulty. On a summer weekend you will see lots of families, children, dogs, etc. 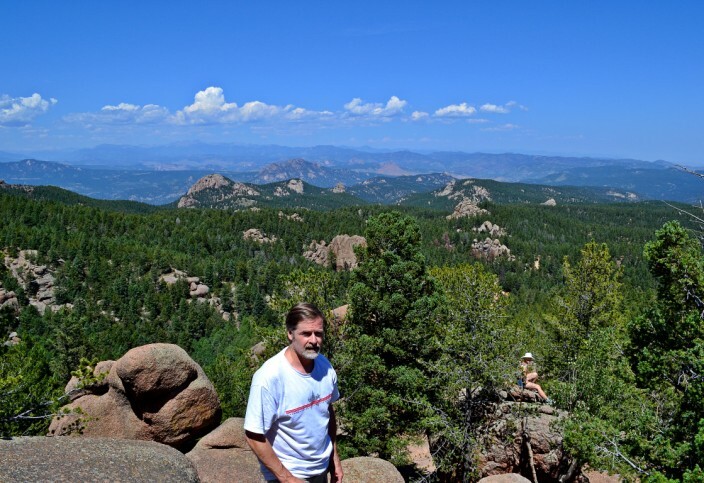 So no, this is not a hike for those seeking Rocky Mountain High type solitude. You’ll have to go a bit farther afield for that. 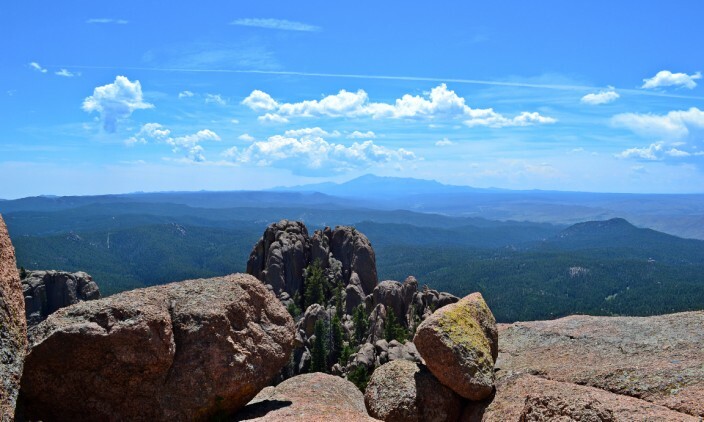 But if it’s spectacular, unobstructed 360 degree mountain views you’re after, Devil’s Head fits the bill and then some. One thing to beware of is lightning strikes. 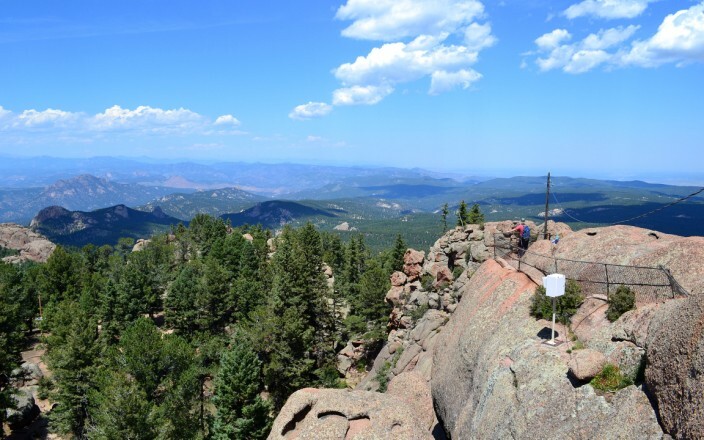 This is the highest point around and the Front Range is notorious for lightning, especially on warm summer afternoons when frequent thunderstorms pop up in the region. So if the weather looks iffy in this regard, don’t chance it. 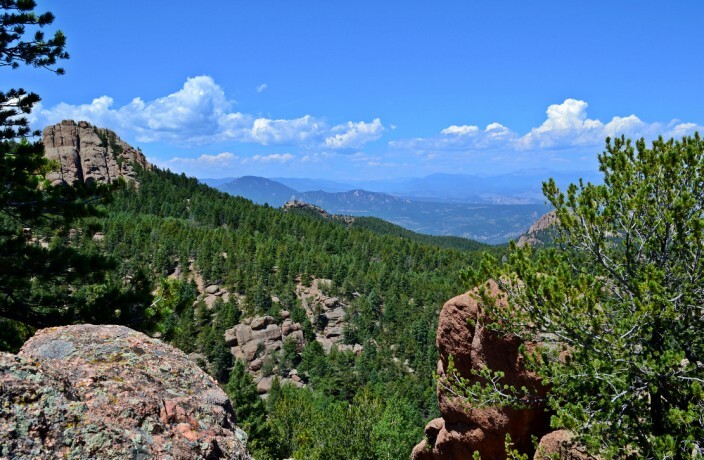 The trail itself begins in mixed aspen and pine forest and offers many opportunities for vistas into the distance as you gain elevation. Rock formations abound, both nearby and far away. A bonus for me, as someone who does most of his hiking in the soggy Cascade mountains of Washington State, was the simple pleasure of basking in the sunshine and not even thinking about carting along rain gear. 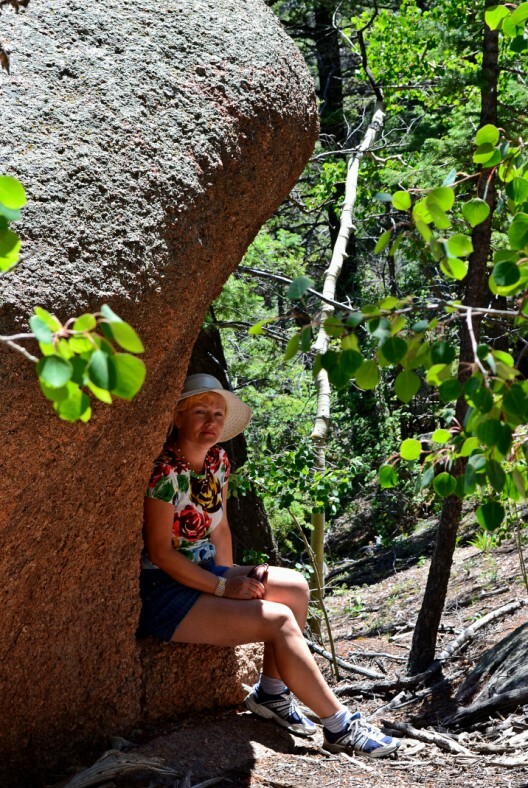 It is, of course, a totally different sort of hiking experience: drier and dustier, yes, but I enjoyed the more open surface terrain of an area where you could actually see through the trees and not need a machete to hack through impenetrable undergrowth if you wanted to step off-trail. Once you reach trail’s end, it opens into a small meadow where sits the cabin which serves as home for the ranger who mans the lookout tower. This is a good place to stop for a rest, lunch or simply catch your breath before heading up the stairs to the lookout tower. The climb is fun but it’s the view from the top which is the highlight of the whole trip. On a clear day it’s said you can see 100 miles in every direction and I don’t doubt it one bit. The day we went there was some forest fire haze in the air and the view might have been limited to more like fifty or sixty miles. Still, no complaints from me. It’s well worth the effort and then some. Be sure to take a look inside the tower and have a chat with the rangers, who are friendly and informative to a fault. We took our time enjoying ourselves at the top, soaking in the views and not wanting to leave. 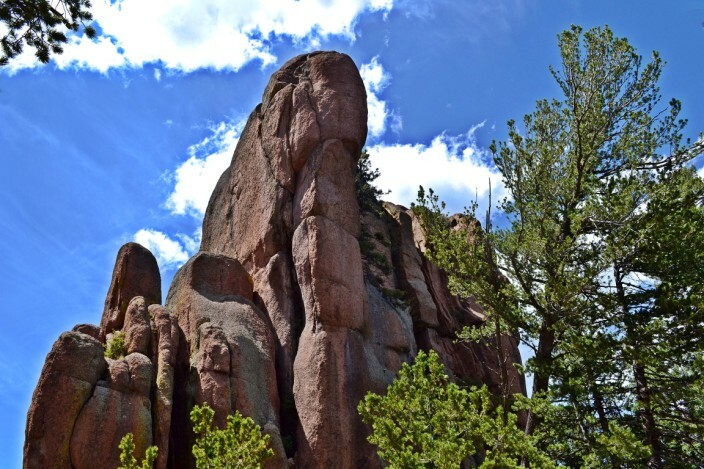 If you’re ever in the Denver or Colorado Springs vicinity and looking for a great way to spend a day and see the Rockies, give Devil’s Head a chance to impress you, too. You’ll be glad you did.